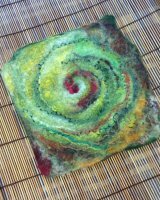 Helen offers individuals and small groups the opportunity to learn the basics of wet felt making using wool, silk and other beautiful textiles. 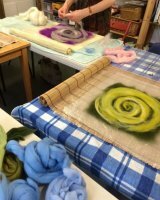 Gathering together, learning something new and nurturing our creativity is hugely therapeutic in the well equipped workshop which can accommodate up to four people comfortably with high levels of guidance and encouragement. Based at the Ruskin Glass Centre within a community of art and craft makers with a café on site. Workshops are run throughout the year and as requested.